Taylor Swift fans have been in a frenzy as of recent with an alleged tracklist for the singer-songwriter’s highly anticipated fifth studio album, 1989 circulating Twitter this past week. 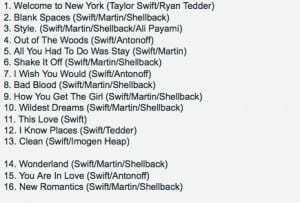 According to multiple reports, the alleged tracklist that surfaced (pictured) has not been confirmed by Swift or her reps, however, multiple things suggest this may be the actual tracklist. Other collaborations on the album include those with Max Martin, Ryan Tedder and Imogen Heap who is credited as a co-writer for the track “Clean,” all of these collaborations which have been previously reported for the album. Another very likely track to be featured on the album as the alleged tracklist suggests is “Welcome to New York.” Swift has been very public about her move to New York and her love for the city, so it’s more than likely that this is a cut on the album. In fact, Swift used the alleged song title to open her live broadcast announcement via Yahoo! back in August. Though the tracklist has not been confirmed, there are many signs suggesting the alleged leak might just be the real deal, fans will have to wait and see. In anticipation for the release of the album Swift has held a series of Secret Sessions in multiple cities where she personally invited fans into her home, baked treats and shared the album exclusively with them. This is pretty! I really like this birthday image. Have a marvelous day. I just want to tell you that I’m newbie to weblog and seriously liked this page. More than likely I’m going to bookmark your blog post . You really have awesome article content. Thanks a lot for sharing with us your webpage.